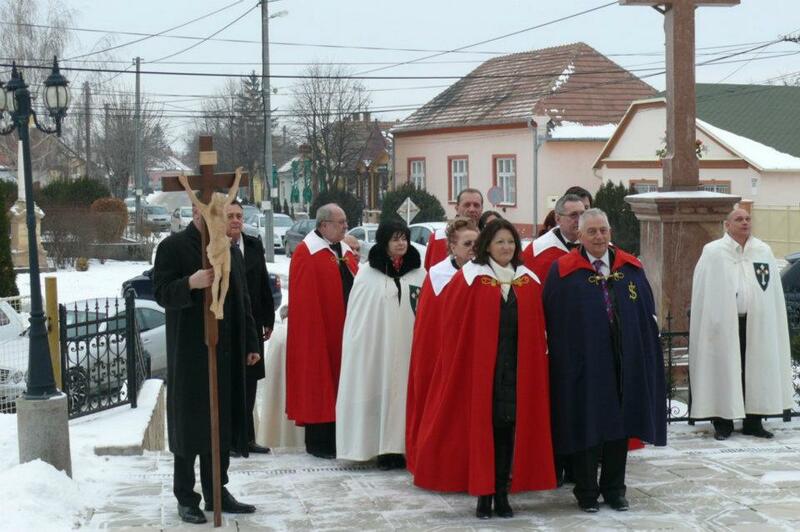 On the 11th February 2012 the commemoration on the „World Day of the Sick” was held in Veľký Meder (Nagymegyer), Slovakia. In 1993, upon proposal of His Holiness, Pope John Paul II. the 11th day of February was devoted to the sick, who himself bore patiently his illness and sympathised deeply with the sick people, wherever they live in the world. And if we translate all this to family level, we have to face the fact that almost everyone is involved in some form and degree with sick people. That is why solidarity and compassion for the sick are extremely important. 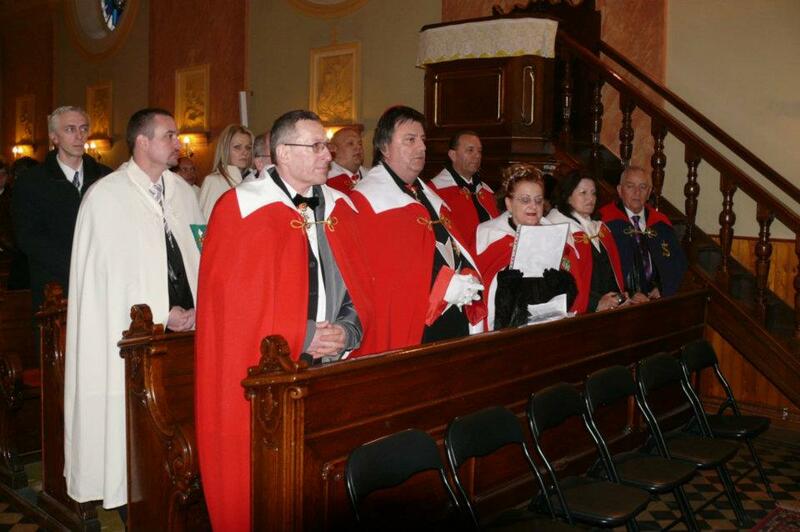 Under the patronage of the Sovereign Order of Saint John of Jerusalem, Knights of Malta, Federation of the Autonomous Priories (KMFAP) and its associate, the Ordo Hungariae for the first time the commemoration has been organised independently by the Slovakian Priory of KMFAP, thanks to the great work of our members: Lady Mária Czellárikova, Sir Alexander Czellárik – Prior of Slovakia, and Sir Monsignore László Szakál (Monsignore Ladislaus) – Magisterial chaplain. 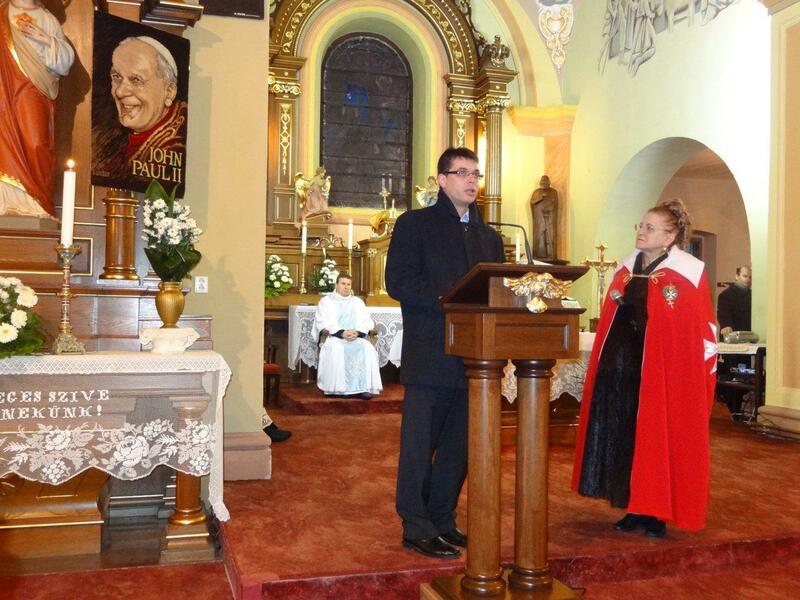 In the afternoon the Slovakian and Hungarian knights and dames of the different Orders gathered in the parish, where Monsignore Ladislaus, parish priest for Veľký Meder warmly welcomed everyone. The Holy Mass – dedicated to the sick – began at 4 pm in the St. Nicholas Parish Church, and was celebrated by Monsignore Ladislaus and Mgr. László Parák, archdeacon of Šaľa (Vágsellye). After the solemn entry of our knights and dames the commemoration began, where members of the congregation appeared in large numbers as well. All those knights, who said prayer and request towards healing of the sick, went one after the other to the microphone, which was placed in front of the portrait of His Holiness, Pope John Paul II. - hanging on the beautifully renovated and decorated wall of the church. Some of the sick people were mentioned by name, as Sir Frank Philipoom – Knight of Malta, Knight of Sword and Silence from the Netherlands – who valiantly fight against cancer. Luka Cugelj (protégé of our French postulant, Ronan Chatellier) – a seriously ill Slovenian boy was also mentioned, who had stroke at the age of 11. Lady Mária pleaded for the improvement of his condition too. 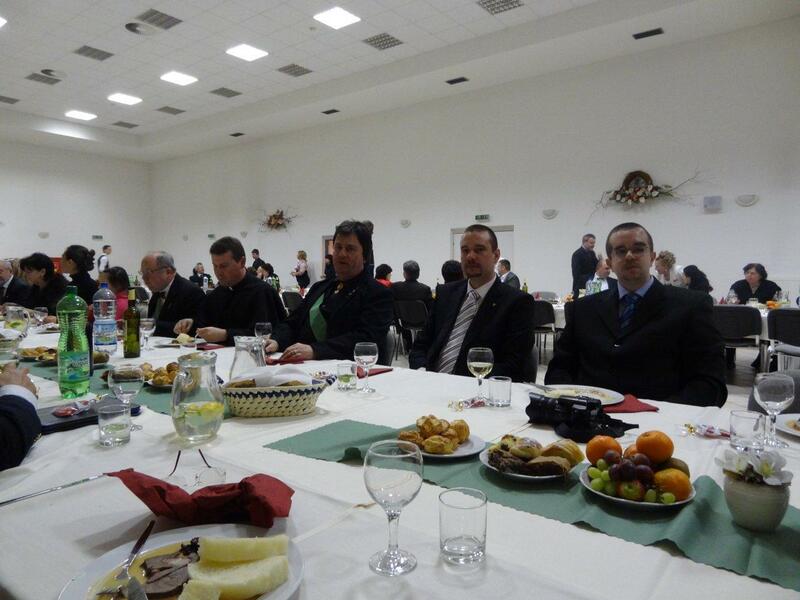 The Trnava Diocese and Bishop's Office, as well as the local Caritas organisation were represented, whose director Ing. Boris Hrdý also prayed for the sick people. The appreciation included all people – providing main mission in healing – such as doctors, nurses, caretakers, whose work, expertise and dedication are elementary for the sick people to exist. 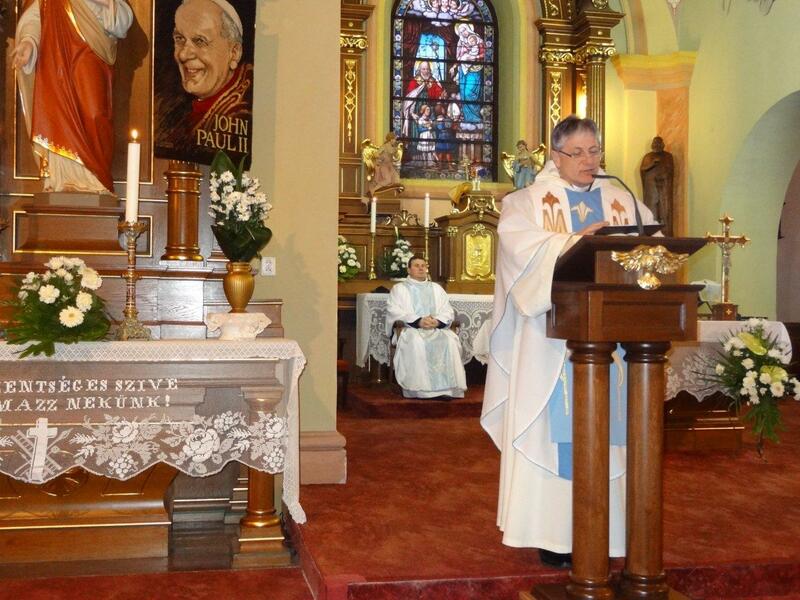 The sermon on soul of Monsignore Ladislaus, the beautiful singing of the Janiga József choir of Veľký Meder as well as the Ave Maria interpretations (Schubert and Wolf compositions) of Dame Zsuzsanna Csonka contributed much to the sublime mood and elation of the commemoration and the Holy Mass. The collected donations will be used for charity. After the memorial service the evening continued in the Community Centre of the city with an extraordinary agape (love feast) for the participants. Lady Mária and Sir Alexander – who covered the expenses of the entire evening – were expecting about hundred people to the long beautifully-laid tables. The five-course dinner – created by Tobias master-chef – with elegant service, the fine wines, soft drinks, the tasteful cakes and pies, as well as the great band made such a fantastic atmosphere in the great hall, with which people meet only in exceptional occasions. This was a really great opportunity to meet friends, to get acquainted with each other, to talk and recall memories. This year's commemoration was an unforgettable and nice event, which is also clearly superior to the quality of the last year's „World Day of the Sick”. congratulations on the organisation of this great commemoration! We are extremely proud that KMFAP was sponsor of this prestigious event again, and we truly hope that we managed to create a tradition with this significant and extraordinary program. Your generosity, personal sacrifice and dedication are great examples to follow for all the Knights and Dames of our Order.